Accumulating additional food and water to your already existing disaster supplies will ensure that your family has what they need to stay healthy during a disaster. When an impending disaster threatens our area, the first instinct is to run to the store and stock up on emergency food and supplies. However, everyone else has the same brilliant idea, which means emergency food and supplies will be in high demand and depleted if you didn’t time your trip to the store well. There is nothing worse than leaving a crowded store with no storm supplies and a disaster bearing down upon you. 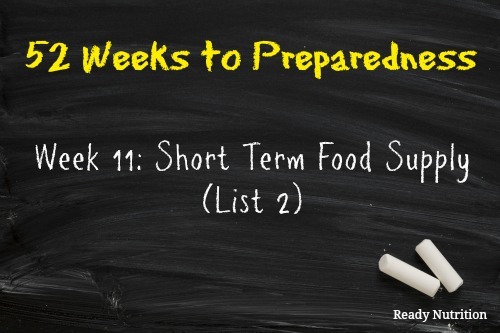 Storing food for storms is not the only reason you should have an emergency food supply. In fact, due to current state of the economy, you are more likely to run into an emergency with a disappearing budget. Food prices have been soaring during the past few years, and there doesn’t seem to be any relief in sight. Have you considered looking at your emergency supply as an investment? Many of the food items you will be purchasing over the next year are considered commodities (e.g., sugar, wheat, corn, rice, etc). Why not make the investment and purchase food at today’s prices and consume at tomorrow’s higher prices? Those of you who have water stored know that it takes up a lot of space. When storing a short term water supply, purchase the 5- or 10-gallon water containers. Note: The 5-gallon water containers are easier to organize if you place them on their sides and stack them. Another suggestion is to reuse your juice and soda bottles. As long as the container is comprised of food grade plastic, it is safe to reuse; however, make sure that the plastic container is washed well before reusing. I recommend investing in a water filtration system. While water filters, such as Katadyn or even Berkey, are a little pricey, they can be used multiple times and would be a good preparedness item to have on hand in case of a longer-term emergency. The following items will create a broad selection of foods that can be consumed in an emergency situation. You can create foods like biscuits and jelly, cereal and milk, oatmeal, sandwiches, soups, pastas, casseroles, etc. Constructing an emergency menu now before a disaster happens will enable you to see what foods you have and what foods you may need. 1 gallon of water per day for each member of the family (i.e., 1-2 weeks worth). 2 canned goods (e.g., meat, veggies, soup, and fruit) per family member. Infant Formula – Note: Call me crazy, but this has a huge amount of vitamins and nutrients and could be utilized for immune boosts. 1. Date perishable goods with a permanent marker. 2. Find a storage area in the home where emergency food supplies can be placed. Those who are living in small living spaces have rented air conditioned storage facilities to store their supplies. 3. Organize the food and begin creating a list of the items you have according to categories (e.g., condiments, baking supplies, canned goods, medical supplies, etc.). Ramen noodles are junk food. Way too salt laden to be worth ingesting. They are very cheap so you could buy a lot of them for next to nothing and would you rather eat Ramen Noodles or nothing? You can add more water to dilute the salt. Ramen is an excellent source by it’s self or you can use it as a soup starter and add fresh veggies. It’s also perfect for bartering. If you store your emergency food in a storage facility and the grid goes down, you will not be able to retrieve your supplies. Just to be helpful – my child was very picky with formula so I actually tasted them before I gave them to him. The toddler formulas are FAR more palatable than the infant ones, they taste less like dirt and more like milk. Just a thought! I work for a Storage Company. Climate control units are in buildings, behind electronic gates. Your food supply may not be accessible during power outage. Warning. Also it is against all storage rules to store food in these facilities because it attracts bugs and rodents. You are breaking your lease terms. Find another place to store these items.